Christmas was special for the prayer buddies, as both students and seniors worked very hard to give each other a meaningful gift. One student in the class and her mom even made tissue holders for every homebound. 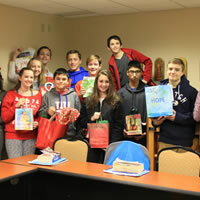 Pictured are the 8th grade students holding gift bags which included letters written by the elderly about their faith journeys. Mrs. Vizzoni and Mrs. Metcalf look forward to continuing to pray with their students for their senior prayer buddies the rest of the year. The Homebound and the youth are mutually benefiting from one another.